On the 24th (Fri), steep yourself in history at Mysore Maharajah's Palace (Amba Vilas), then admire nature's wide array of creatures at Sri Chamarajendra Zoological Gardens, then take in the spiritual surroundings of Sri Chamundeshwari Temple, and finally contemplate the waterfront views at Karanji Lake. You can plan Mysuru (Mysore) trip in no time by asking Inspirock to help create your itinerary. Ankara, Turkey to Mysuru (Mysore) is an approximately 21-hour flight. You'll lose 2 hours traveling from Ankara to Mysuru (Mysore) due to the time zone difference. Expect slightly colder evenings in Mysuru (Mysore) when traveling from Ankara in August, with lows around 23°C. Wrap up your sightseeing on the 24th (Fri) early enough to travel to Hyderabad. Start off your visit on the 25th (Sat): don't miss a visit to Charminar, examine the collection at Salar Jung Museum, then contemplate the long history of Golkonda Fort, and finally contemplate in the serene atmosphere at Birla Mandir. To find traveler tips, other places to visit, where to stay, and more tourist information, use the Hyderabad trip planning site . Getting from Mysuru (Mysore) to Hyderabad by flight takes about 5 hours. Other options: do a combination of bus and flight; or drive. While traveling from Mysuru (Mysore), expect somewhat warmer days and about the same nights in Hyderabad, ranging from highs of 36°C to lows of 26°C. Finish your sightseeing early on the 25th (Sat) to allow enough time to travel to Thiruvananthapuram (Trivandrum). Visit Kovalam Beach and Lighthouse Beach for some beach relaxation. Popular historic sites such as Sree Padmanabhaswamy Temple and Beemapally Mosque are in your itinerary. Explore the numerous day-trip ideas around Thiruvananthapuram (Trivandrum): Chowara Beach (in Chowara), Varkala Beach (in Varkala) and Hawa Beach (in Kovalam). The adventure continues: examine the collection at Puthenmalika (Kuthiramalika) Palace, don't miss a visit to Vizhinjam International Seaport, enjoy the sand and surf at Shanghumukham Beach, and admire the masterpieces at Shri Chitra Art Gallery. For maps, reviews, and tourist information, refer to the Thiruvananthapuram (Trivandrum) trip itinerary builder website . You can fly from Hyderabad to Thiruvananthapuram (Trivandrum) in 2.5 hours. Other options are to drive; or take a bus. In August, daytime highs in Thiruvananthapuram (Trivandrum) are 36°C, while nighttime lows are 28°C. Wrap up your sightseeing on the 29th (Wed) to allow time to travel to Kochi (Cochin). Popular historic sites such as Paradesi Synagogue and Karingachira Church are in your itinerary. Let the collections at Kashi Art Gallery and Antique Museum Kochi capture your imagination. Step out of Kochi (Cochin) with an excursion to Andhakaranazhi Beach in Alappuzha--about 1h 10 min away. There's much more to do: enjoy the sand and surf at Cherai Beach, don't miss a visit to Chinese Fishing Nets, admire the masterpieces at Kerala Folklore Museum, and see the interesting displays at Hill Palace of Tripunithura. For other places to visit, ratings, photos, and other tourist information, go to the Kochi (Cochin) trip app . You can do a combination of flight and taxi from Thiruvananthapuram (Trivandrum) to Kochi (Cochin) in 1.5 hours. Alternatively, you can drive; or take a train. In August in Kochi (Cochin), expect temperatures between 36°C during the day and 28°C at night. Finish your sightseeing early on the 2nd (Sun) to allow enough time to drive to Munnar. Step out of the city life by going to Rajamalai (Eravikulam) National Park and Chinnakanel Water Falls. There's still lots to do: examine the collection at Tea Museum, admire the natural beauty at Tea Gardens, take some stellar pictures from Lockheart gap, and see human ingenuity at work at Mattupetty Dam. To find reviews, other places to visit, more things to do, and more tourist information, refer to the Munnar trip maker website . Drive from Kochi (Cochin) to Munnar in 2.5 hours. Expect a daytime high around 36°C in September, and nighttime lows around 28°C. Finish your sightseeing early on the 5th (Wed) to allow enough time to drive to Thekkady. You'll explore and learn at Green land spice garden and INTERPRETATION CENTRE Periyar Tiger Reserve. Deepen your sense of the past at sights like Shiny Tours & Travals and Mangladevi Temple. There's much more to do: identify plant and animal life at Periyar Tiger Reserve, revel in the low prices at Tropical Chocolate Factory, take some stellar pictures from Chellarkovil Viewpoint, and take in nature's colorful creations at Abraham's Spice Garden. To find maps, other places to visit, photos, and tourist information, use the Thekkady trip builder site . Drive from Munnar to Thekkady in 2 hours. Wrap up your sightseeing on the 8th (Sat) early enough to travel to Mararikulam. Your inner history buff will appreciate St. George Orthodox Church and Thiruvizha Sree Mahadeva Temple. Satisfy your inner culture vulture at Mararikulam Sree Mahadeva Temple and Vaikom Mahadeva Temple. Explore the numerous day-trip ideas around Mararikulam: Andhakaranazhy Beach (in Andhakaranazhy) and Kumarakom Bird Sanctuary (in Kumarakom). 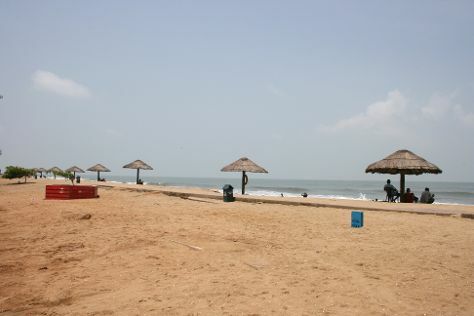 There's still lots to do: kick back and relax at Marari Beach and tour the pleasant surroundings at Mararikulam Beach. To see photos, more things to do, ratings, and more tourist information, you can read our Mararikulam holiday tool . You can drive from Thekkady to Mararikulam in 4 hours. In September in Mararikulam, expect temperatures between 36°C during the day and 28°C at night. Finish up your sightseeing early on the 11th (Tue) so you can travel back home.